« Alice Ottley – Her Life and Legacy: a commemoration. 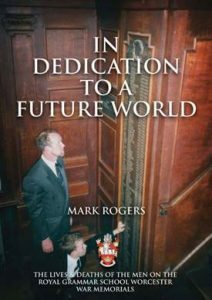 Having recently been invited to provide a forward to the second edition of Mark Rogers’ book “In Dedication to a Future World”, it is nice now to have the chance to recommend it as worthy of purchase by anyone with any connection with our school. In the year marking the centenary of the First World War and the seventieth anniversary of momentous events in Normandy and elsewhere of the Second, members may wish to have the opportunity to purchase a copy. Mark Rogers was to be congratulated for his original enterprise and personal determination, when he produced the first edition entirely under his own steam. We of the Association welcome the chance he has offered us to assist with the production of a second edition, a copy of which will be given to every pupil and member of staff in the senior school by the Association. The ex-scholars of the Royal Grammar School flocked to the Colours with men from all over Worcestershire in 1914. I met several of those who returned safely. They were the fathers of a number of my school friends. In 1939 it was the same. I recall the names of something approaching fifty per cent of the lads who feature in the second half of Mark’s book and many were my closest friends. It is my hope that each boy and girl will read the stories Mark has put together so vividly. If this applies to their fathers and mothers and to any others who may chance upon the book I shall be even more delighted. Copies can be obtained from RGS Reception price £6 (cheque payable to The Alice Ottleians & Old Elizabethans’ Association) if collected in person, or ordered and posted to a UK address for £7.50. Please click here to download an order form. Alice Ottley – Her Life and Legacy: a commemoration.